flagRSP MoP is an add-on that allows you to set a title, first name, and last name as well as setting a character status and a roleplaying flag. Other users of this add-on will be able to see these flags and you will be able to see theirs. This is mainly useful for RP servers, but there's nothing preventing you from using this on servers of other types. Feel free to report any bugs or request features here. flagRSP MoP (formerly known as flagRSP BC, flagRSP WotLK, and flagRSP Cataclysm) is the original flagRSP add-on updated and enhanced for the World of Warcraft 5.0 patch. This continued version bases on the work done by Flokru and Adriathys. Since both authors have abandoned the project I picked up the code and fixed some open bugs. a) If you have no target, or want to add someone else, you have to insert the correct ingame name like "Syeira-Forscherliga" or "Syeira"
You make a character on the foreign realm, e.g. "Argent Dawn". Go to the people you want the flag from, and mouseover them. Wait a little until you can see their flags. Then you can logout and switch back to your character. The next time you see them, you should have a flag for them (but it might be outdated). all flags older than 2 months (the default is 14 days). flagRSP MoP is fully translated to English, German and Russian language. Translations for other languages are wanted, so if you like, feel free to send me your own. A French localization which covers about 90 percent is included. flagRSP MoP now supports the MarySue protocol (MSP). As there should be only one addon implementing MSP, please run only one of flagRSP, FlagRSP2, TotalRP 2 or MyRolePlay. * The engine title is shown in the tooltip correctly. * Positioncursor in the description box has been found and send back to its work. * You can set the InfoBox to be shown always instead of showing it for individual toons. If alwaysshown is active, the button at the target will be hidden. * Merged the fields for name and surname into one, called "fullname"
* Changed strings to detect away status on english clients. * The state of the minimap button (shown/hidden) is now saved and will be kept when relogging. * flagRSP now remembers again if you don't want to see the tips on startup anymore. * Fixed an error that occurred when you hovered a npc and your character had learned only one profession (*sigh*). * Fixed an issue that prevented editing the character description. * Fixed an error that occurred when you hovered a npc and your character had learned no professions. * Fixed an issue with an error message that could crop up when starting flagRSP for the very first time. * Fixed an issue that caused flagRSP to break afk mode on German clients. 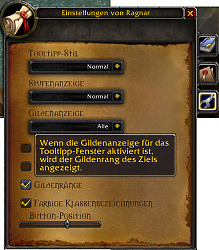 * Fixed a possible repetition of 'skinnable' in the tooltip. * Fixed incorrect coloring of unit names in light mode. * Infobox is now movable even if "AlwaysShowInfoBox" is set. * /rsp owntooltip works again. * Fixed display of alternative level descriptions. This caused the tooltip to be empty after patch 3.2. 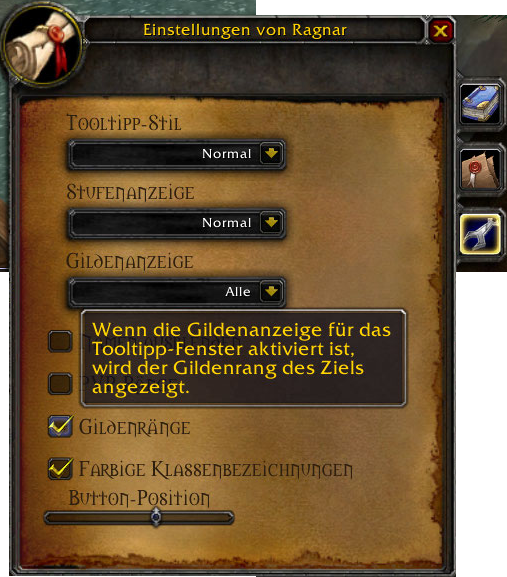 * Ever wondered why the tooltip switches back to default tooltip rendering from time to time on some characters? A new hook is added to prevent this. * Friends and enemies on your friend list are colored green and red again. Guild entries are colored slightly lighter than character entries. * The title of a character is now displayed colored in the info box. * Removed some "Did you know?" hints that were not applicable anymore. Typhix: Set the default state for the minimap button to on. Typhix: Fixed a bug that prevented showing prenames of yourself and known persons in the tooltip if the option hiding names was activated. Typhix: Fixed a bug that could crop up while logging into the game. Typhix: Fixed two minor bugs that could occur while reading tooltips. Typhix: Character titles are now displayed in yellow color. 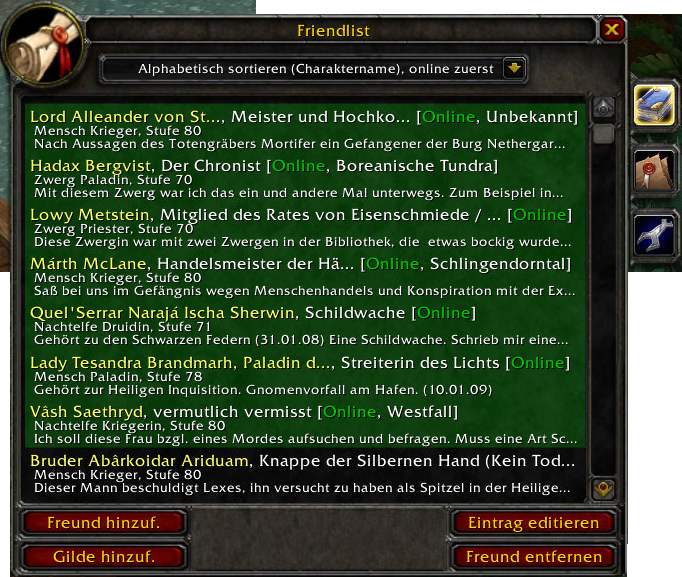 The friendlist shows the character names now in a slight different color. Typhix: Removed flagRSPloader from package. flagRSP WotLK now is no load-on-demand addon anymore. Typhix: Fixed a bug that prevented vertical scrolling in flagRSP's friendlist. Typhix: After a couple of hours of testing on PTR an error occured while determining the owner of a pet/minion. I don't know exactly what triggered this and was not able to reproduce it a second time. Nevertheless I added an error handling routine for this case. If the owner of a pet/minion cannot be determined, flagRSP now will simply omit the corresponding tooltip line. Typhix: Removed unused font from package. Typhix: flagRSP is a load-on-demand addon again. Version 1.0.0 was only loaded on demand when flagRSPLoader was enabled. Typhix: Blizzard changed numerous native functions with the upcoming WoW 3.0 patch. 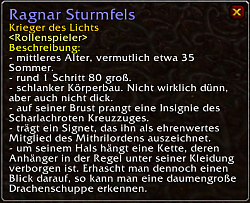 Several fixes done to keep flagRSP working with Wrath of the Lich King expansion. Typhix: Changed addon name to "flagRSP WotLK". Typhix: Version number miraculously jumped to 1.0.0. It was time I think. Typhix: Updated TOC for WoW 3.0. Typhix: Tidied up the zip package. There were a whole lot of useless files and folders in it. * Updated TOC and version number after intensive testing. * FlagRSP will not toggle between afk and non-afk anymore. * FlagRSP FriendList shows whom of your friends are online again. * FlagRSP will not forget your character's description from time to time anymore. not sure what's going on, but it seems that at random intervals, I am completely unable to see my own description. I haven't seen other players yet so I don't know if the same thing will occur, but it seems pretty unpredictable so i assume so. I mean, I just alt-tabbed back into the game and the description was visible again. a couple of minutes later it was gone and i couldn't get it back. this is rather peculiar. First of all, thank you for this wonderful addon, I will use this alot since I just started playing on a RP server. I have one issue though, at first when I login and view my character pane, it's fine, my whole name is displayed i.e name+last name. But as soon as I close the pane and open it again, my last name disappears. If I relog, it gets fixed until I close the pane again. Is there any way to fix this with some sort of command ingame? What they do is they practically post an entire song, or put quotes, or just random garble as their title and therefore the hover-over tooltip that shows up covers the entire bottom half of your screen. It covers the hotkeys, the chatbox, etc because of how large the tooltip becomes when stretched. Wow... people are so lame that they take the time to do this just to annoy RPers? Sorry to hear that. I've actually been thinking of playing on an RP realm a bit just to get away from morons like this. Hello there, just a quick question. Is there any actual difference between FlagRSP2 and FlagRSP Cataclysm? I'd assume they'd both register with one another if person A was using RSP2 and person B was using RSP Cata, I'm just curious is all. I prefer RSP Cataclysm due to the UI and how it functions, but I just want to make sure I'm not missing out on anything by not using RSP2. I would absolutely love it if the option to cut off tooltips when hovering over a character with your mouse is implemented such as how FlagRSP2 does it where the cutoff limit is 8 words. I prefer RSPCata because of the UI, is all. Just when hovering though, when you click on someone it's automatically kept short and squished. The problem is simply the hovering tooltip has no cutoff limit. Thank you for reading my suggestion. Last edited by Everlet : 11-15-10 at 04:09 PM. FlagRSP shouldnt conflict with My Roleplay anymore since the other is using a totally different protocol now. In fact, the author of MRP has mentioned that they would like to have the three RP addons using that new protocol. I was able to solve the problem with the read-only description field. An update is online. @Lalaith: Could you please send me those lua errors you receive? I have the same problem as Lalaith. Thank you very much for the update! thanks for Update but I can't write in the description fiield - name and titel works. Done something wrong?? Last edited by Lalaith : 10-15-10 at 04:10 PM. I noticed a minor bug. When skinning a quest mob, "Skinnable" repeats in the tooltip. It works fine on anything else. I'm using the latest version for 3.3 and this is the only mod I use. FlagRSP and SpamMeNot aren't good play-mates! Just a warning to folk that might have one of these AddOns and want to use the other: flagRSP and SpamMeNot (SMN) do NOT play nicely, together! 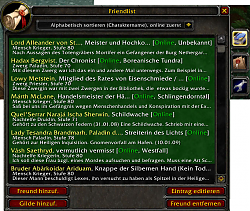 I don't know if an addon can mark its Comm Channel as "high-traffic" to avoid SMN watching it, but as it stands, SMN will go nuts on the xtensionxtooltip2 channel that flagRSP uses and register spam complaints about anyone sending 2 or more <D##> update tags (of any decent length). Would love to be able to use both of these addons together. Figured it was worth the heads-up to both the author and other users of these addons, as SMN's autoflagging of other users means that not only are the "offending party" auto-ignored, spamming the report feature is not necessarily a good thing (for the user). At the very least, if SMN doesn't have a channel-exclusion feature available in it that flagRSP could use, it'd be a really useful feature-request for it. This one stores all data that flagRSP collects from other players. It is used by all your characters. There exists a copy of this one for each of your chars. 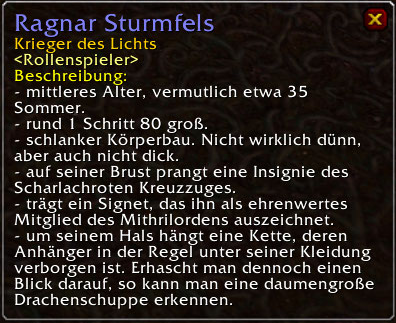 This file stores all your flagRSP settings and the corresponding character flags und descriptions. This is the most important one. "To prevent loss of your description and Friendlist entries you should REGULARLY backup flagRSP's settings. Look into flagRSP's readme to find out how to backup this data." Unfortunately, I can't find anything in the documentation on this. I want to clear out some of my WTF files, but I'm afraid of losing my flagRSP data.